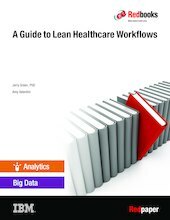 Is Lean a fit for your healthcare organization? Various methodologies can be used to help organizations achieve their objectives depending on their criteria: lowest risk of failure, fast to resolution, or lowest cost for deployment. But what every organization should consider is which methodology will have the greatest impact. Lean, a systematic approach to understanding and optimizing processes, may be the fit for your organization. Learn more in this new IBM® Redpaper™ publication, A Guide to Lean Healthcare Workflows, by Jerry Green and Amy Valentini of Phytel (An IBM Company). It describes each step in-depth and includes techniques, example worksheets, and materials that can be used during the overall analysis and implementation process. And it provides insights that are derived from the real-world experience of the authors. This paper is intended to serve as a guide for readers during a process-improvement project and is not necessarily intended to be read end-to-end in one sitting. It is written primarily for clinical practitioners to use as a step-by-step guide to lean out clinical workflows without having to rely on complex statistical hypothesis-testing tools. This guide can also be used by clinical or nonclinical practitioners in non-patient-centered workflows. The steps are based on a universal Lean language that uses industry-standard terms and techniques and, therefore, can be applied to almost any process.